Hip dislocations, regardless of their etiology, are orthopedic emergencies that require immediate diagnosis, evaluation, and treatment. The adult hip joint is remarkably stable. It is reinforced with thick capsular and labral structures. The presence of a dislocation injury indicates a large force from a traumatic mechanism (a traction force ≥90 lb) or the existence of underlying pathology leading to inherent instability of the joint. Posterior dislocations make up 80-95% of traumatic hip dislocations. In the presence of a large force injury, Advanced Trauma Life Support (ATLS) measures may have to be initiated in the initial assessment of the patient. Pediatric hip dislocations may occur with smaller amounts of force and have been documented after gymnastic maneuvers and falls from standing. Elderly patients or those with Ehlers-Danlos Syndrome or Down Syndrome are also more likely to dislocate a hip with smaller amounts of traumatic force. Posterior traumatic hip dislocations occur when the force acts with adduction, internal rotation, and some degree of flexion of the hip. The incidence of this injury has increased as a consequence of high-velocity motor vehicle use. Injuries in which the front-seat passengers are involved in a head-on collision that drives the dashboard into their lower extremities (ie, dashboard injuries) have become a notorious cause of posterior traumatic hip displacement. This mechanism of injury is associated with an incidence of simultaneous severe knee injury in 26% of patients, including patellar fractures in 4% of patients. Posterior hip dislocations are also seen after total hip arthroplasty. Relatively minor forces, such as flexing the hip to pick an item up from the floor, can result in postoperative hip dislocation. Several studies [4, 5] indicate that slight alterations in surgical technique (eg, slightly larger femoral head and slightly less acetabular component anteversion) may decrease postoperative dislocation rates. Multiple studies have demonstrated that the ultimate morbidity increases as the time interval from injury to reduction increases. [6, 7] Complications such as osteonecrosis of the femoral head, arthritic degeneration of the hip joint, and long-term neurologic sequelae become more likely as reduction is delayed. Whereas the goal is to perform an adequate reduction as quickly as possible, careful prereduction evaluation must be performed to properly diagnose the injury. If adequate closed reduction cannot be attained or if a nerve palsy becomes apparent after closed reduction is achieved, emergency operative reduction is required. The hip joint (see the image below) is a ball-and-socket synovial joint: the ball is the femoral head, and the socket is the acetabulum. The hip joint is the articulation of the pelvis with the femur, which connects the axial skeleton with the lower extremity. The adult os coxae, or hip bone, is formed by the fusion of the ilium, the ischium, and the pubis, which occurs by the end of the teenage years. The two hip bones form the bony pelvis, along with the sacrum and the coccyx, and are united anteriorly by the pubic symphysis. For more information about the relevant anatomy, see Hip Joint Anatomy. Alonso JE, Volgas DA, Giordano V, Stannard JP. A review of the treatment of hip dislocations associated with acetabular fractures. Clin Orthop Relat Res. 2000 Aug. (377):32-43. [Medline]. Matsumoto K, Sumi H, Sumi Y, Shimizu K. An analysis of hip dislocations among snowboarders and skiers: a 10-year prospective study from 1992 to 2002. J Trauma. 2003 Nov. 55 (5):946-8. [Medline]. Onche II, Obiano KC, Udoh KM. 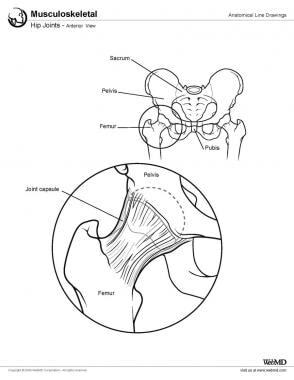 Traumatic posterior dislocation of the hip: distribution and severity of associated injuries. Niger J Med. 2008 Jul-Aug. 17 (3):346-9. [Medline]. Jameson SS, Lees D, James P, Serrano-Pedraza I, Partington PF, Muller SD, et al. Lower rates of dislocation with increased femoral head size after primary total hip replacement: a five-year analysis of NHS patients in England. J Bone Joint Surg Br. 2011 Jul. 93 (7):876-80. [Medline]. Higa M, Tanino H, Abo M, Kakunai S, Banks SA. Effect of acetabular component anteversion on dislocation mechanisms in total hip arthroplasty. J Biomech. 2011 Jun 3. 44 (9):1810-3. [Medline]. Brooks RA, Ribbans WJ. Diagnosis and imaging studies of traumatic hip dislocations in the adult. Clin Orthop Relat Res. 2000 Aug. (377):15-23. [Medline]. Yang EC, Cornwall R. Initial treatment of traumatic hip dislocations in the adult. Clin Orthop Relat Res. 2000 Aug. (377):24-31. [Medline]. Brock G. The occasional posterior hip dislocation reduction. Can J Rural Med. 2015 Spring. 20 (2):65-70. [Medline]. [Full Text]. Mayer SW, Stewart JR, Fadell MF, Kestel L, Novais EN. MRI as a reliable and accurate method for assessment of posterior hip dislocation in children and adolescents without the risk of radiation exposure. Pediatr Radiol. 2015 Aug. 45 (9):1355-62. [Medline]. Mereddy PK, Sunderamoorthy D. Avascular necrosis of the femoral head 8 years after posterior hip dislocation. Injury. 2008 Jul. 39 (7):823. [Medline]. Cash DJ, Nolan JF. Avascular necrosis of the femoral head 8 years after posterior hip dislocation. Injury. 2007 Jul. 38 (7):865-7. [Medline]. Yuksel S, Albay C. Early Reduction of Pediatric Traumatic Posterior Hip Dislocation Is Much More Important Than the Treatment Procedure. Pediatr Emerg Care. 2017 Nov 20. [Medline]. Rodriguez-Merchan EC. Osteonecrosis of the femoral head after traumatic hip dislocation in the adult. Clin Orthop Relat Res. 2000 Aug. (377):68-77. [Medline]. Cornwall R, Radomisli TE. Nerve injury in traumatic dislocation of the hip. Clin Orthop Relat Res. 2000 Aug. (377):84-91. [Medline]. Svoboda SJ, Williams DM, Murphy KP. Hip arthroscopy for osteochondral loose body removal after a posterior hip dislocation. Arthroscopy. 2003 Sep. 19 (7):777-81. [Medline]. Morris AC, Yu JC, Gilbert SR. Arthroscopic Treatment of Traumatic Hip Dislocations in Children and Adolescents: A Preliminary Study. J Pediatr Orthop. 2017 Oct/Nov. 37 (7):435-439. [Medline]. Morrey BF. Results of reoperation for hip dislocation: the big picture. Clin Orthop Relat Res. 2004 Dec. (429):94-101. [Medline]. Phillips AM, Konchwalla A. The pathologic features and mechanism of traumatic dislocation of the hip. Clin Orthop Relat Res. 2000 Aug. (377):7-10. [Medline]. Salisbury RD, Eastwood DM. Traumatic dislocation of the hip in children. Clin Orthop Relat Res. 2000 Aug. (377):106-11. [Medline]. Weber M, Ganz R. Recurrent traumatic dislocation of the hip: report of a case and review of the literature. J Orthop Trauma. 1997 Jul. 11 (5):382-5. [Medline]. The initial position for closed reduction of a posteriorly dislocated hip. The authors and editors of Medscape Reference gratefully acknowledge the contributions of previous author James Emanuel Rodriguez, MD, to the writing and development of this article.